ExtSQL provides detailed usage statistics for MySQL and PostgreSQL database systems. MySQL and PostgreSQL have become standard open source databases on the basis of their active developer communities, solid performance, and reliable operation. 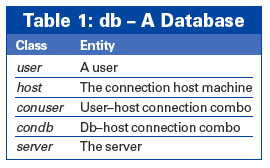 Despite the power and flexibility of these SQL variants, the options for obtaining historical data on database usage are relatively limited. SQL monitoring tools typically focus on gross monitoring at the server level. The Extended Usage Statistics for SQL (ExtSQL) project is an effort to make a much wider range of statistical information available to database admins through simple commands at the SQL command line. In fact, ExtSQL provides advanced admin features for MySQL and PostgreSQL that are not even available in the "big brother" SQL vendors. Database admins can now use ExtSQL to monitor and account for server usage down to the individual database, user, or even connecting client. My company, Software Workshop Inc., developed ExtSQL and currently makes it available as open source software under the GPL. Our hope is that the features implemented through ExtSQL will eventually be implemented by other databases such as Oracle and DB2 and will become part of the SQL standard. In the meantime, ExtSQL takes the form of drop-in replacements for the server daemons used with MySQL and PostgreSQL. In this article, I describe how to install and configure ExtSQL for a typical MySQL installation. The process for setting up ExtSQL for PostgreSQL is similar. The ExtSQL website  has compiled binaries for various OS/hardware platforms available for evaluation and licensing. The most current instructions for installing and using ExtSQL are also available at the ExtSQL website. The first two files are patch files. The patch- file contains the bulk of the changes that make up ExtSQL. The second file (compat-) contains unique fixes for the specific version of MySQL. The do_conf- file contains the exact configure commands used for the source build, so merge this list with any selections you've made. As always, view the README for the latest information. then run the same configure command you used to create your current build of MySQL with the options you desire. 'CXXFLAGS=-O2 -DEXTSQL_50=1 -pipe -m32 -march=i386 -mtune=pentium4'. Then type make as usual to build mysqld. A new mysqld binary in the build directory sql should be the result. Note: The path in the logfile shutdown command should be the same path to which you previously backed up mysqld. Now take a breather. The preceding lines confirm the server was built with the ExtSQL subsystem, and it is currently disabled because no statistics were requested. We recommend you run the server for at least a day and convince yourself things are operating normally. Server performance should not be affected. extsql_class_list="user, max-100, time-120, units-h, (Com_insert, Com_select, Com_update, Com_delete, Com_replace, Qcache_hits, Questions, Slow_queries)"
The command above should be on one physical line in the file. If you change /etc/my.cnf, be sure to remove this line if you revert to a standard mysqld. Errors during initialization or operation will be noted in the error log, and the subsystem will disable itself, leaving MySQL operations intact. In ExtSQL, the entities that interact with the server are called classes (Table 1). Within a class, specific instantiations are called instances. An instance of a user could be domenic or christina, for example. The server class is unique in that the only instance is the server itself. For each instance, you can track individual data items called vars. Vars include almost all of the values displayed in the present SHOW STATUS command. Use the name of the var as displayed by SHOW STATUS; for example, Com_select tracks select statements. Sure, you've heard about systemd, which is rapidly replacing the old System V init system as the go-to service management daemon for the Linux world. But what can you do with systemd really? We'll show you some tricks for improving security, managing processes, and analyzing boot times with systemd. Even hardened nerds are often over-challenged by the less than intuitive field of statistics. Besides the theory, you need to know how to use the software that converts all the theory into a practical application. The developers of a Czech hosting company has released a Web interface for administering virtual servers under OpenVZ.